The first of two models named Prescott was introduced in 1935 and only made for one year. The Prescott is one of a handful of watches that featured moveable lugs. The Prescott came in a 14K gold filled case with only one dial option... a silver dial finished white with solid gold markers. The hand style on a Prescott is called "baton". Prescotts are pretty uncommon models but they do turn up occasionally. 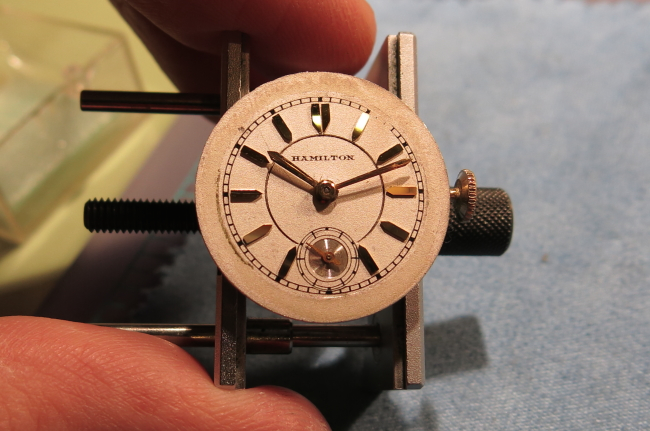 The trick to getting a nice Prescott is to get one with a nice case - as they can wear extensively to the long edge of the bezel between the lugs. I have a nice Prescott that was due for an overhaul so I will show you how it's went. This Prescott has a well-above average case. 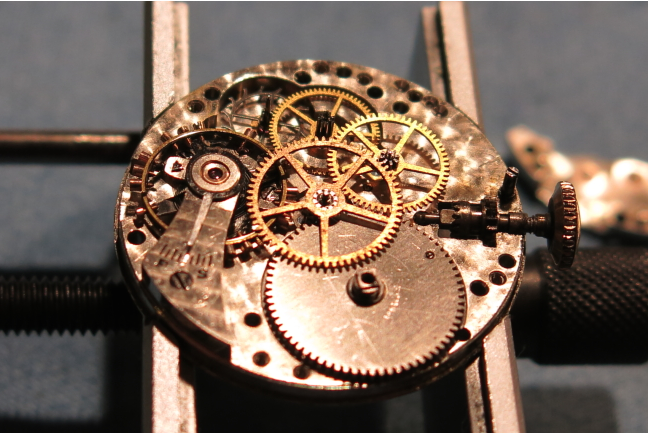 The dial is original. The easiest way to tell is the area within the seconds track is bright finished, where everything else is white. 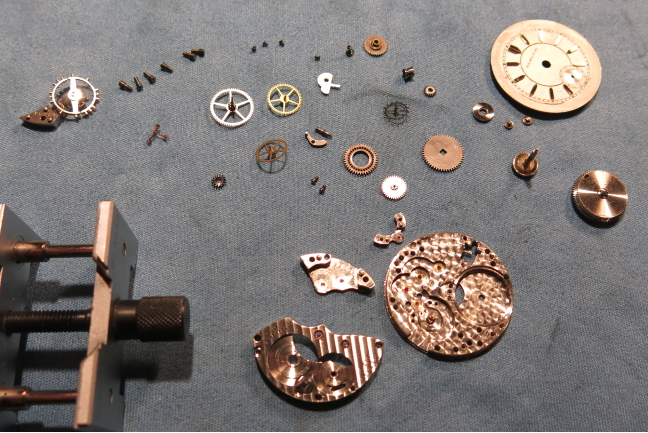 A refinished dial will often have this area white as well - or even painted silver - but it should look like bare silver. 1935 was pretty much the last year of the 987F and you might find a Prescott with a 987E. A 987A would certainly be wrong and a 987 would be too - although both would fit and work fine. 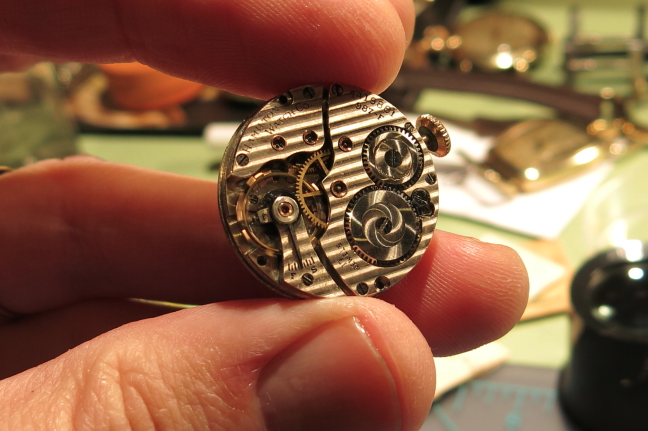 With the movement out of the case back, the first thing to come off is the hands. 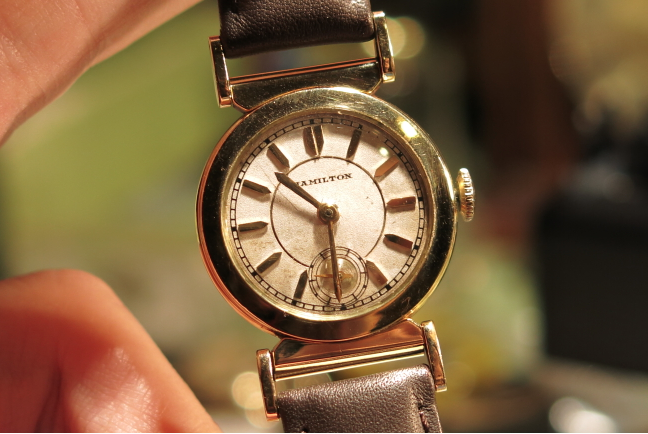 The second hand will come off when I remove the dial. 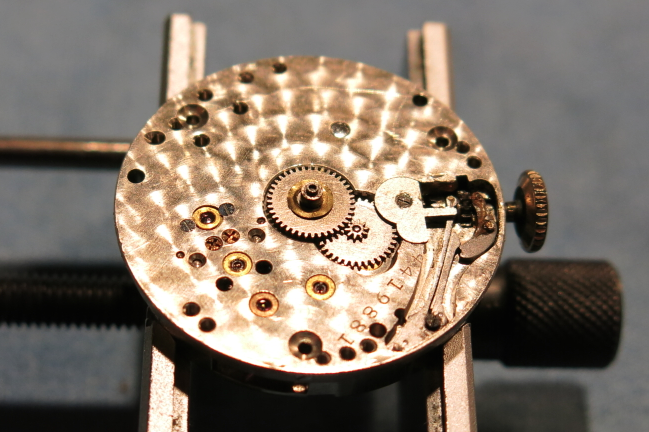 With the dial gone, the cannon pinion, hour wheel, minute wheel and setting wheel can come off. 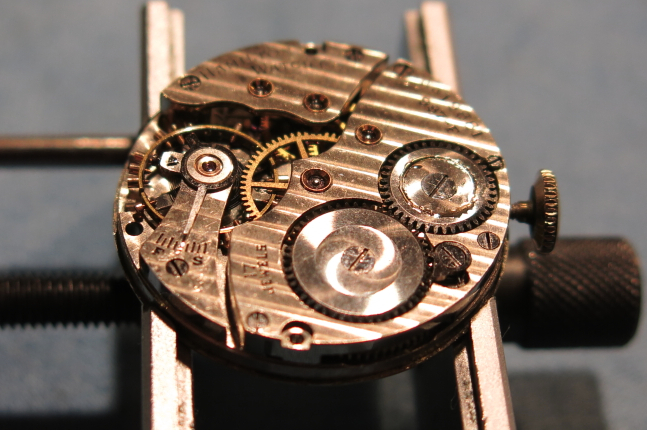 With the front cleaned of the movement is ready to turn over. 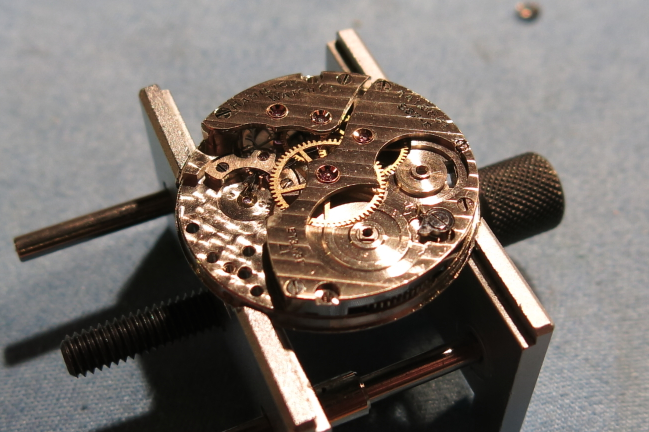 The fist thing to do with the back exposed is to release the tension from the mainspring - this one had run all the way down so no tension was left. 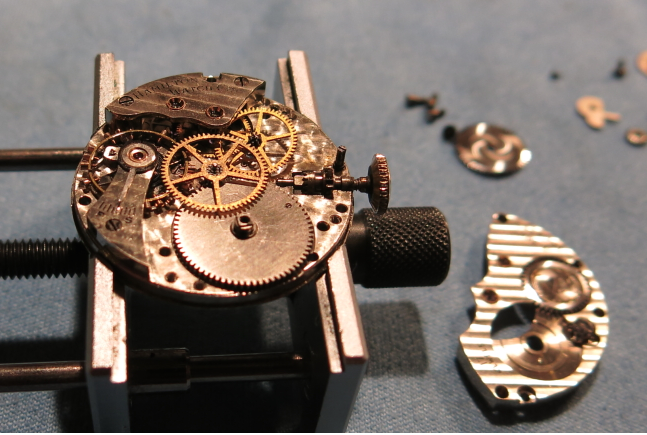 Next, the barrel bridge is removed, along with the winding wheel and ratchet wheel. 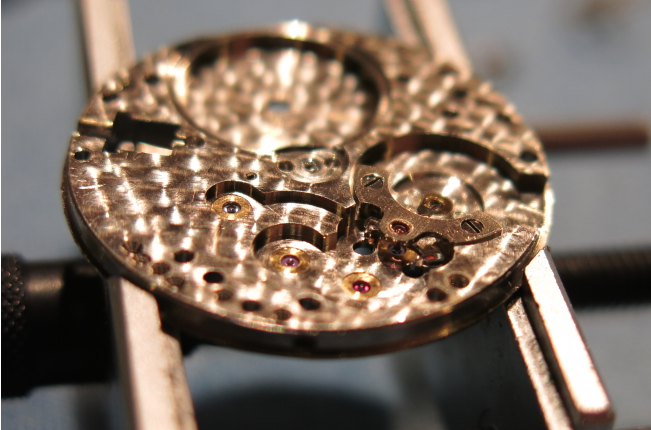 The mainspring barrel, center wheel and third wheel are exposed once the bridge is removed. 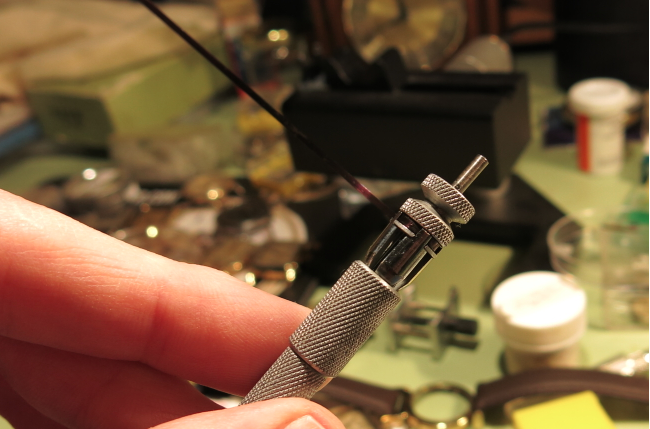 The stem, winding pinion and clutch come out at this point too. Two screws hold the train bridge on. Once they are removed the fourth wheel and the escape wheel are ready to come out. Everything is removed with the exception of the balance and pallet fork. They come off next. 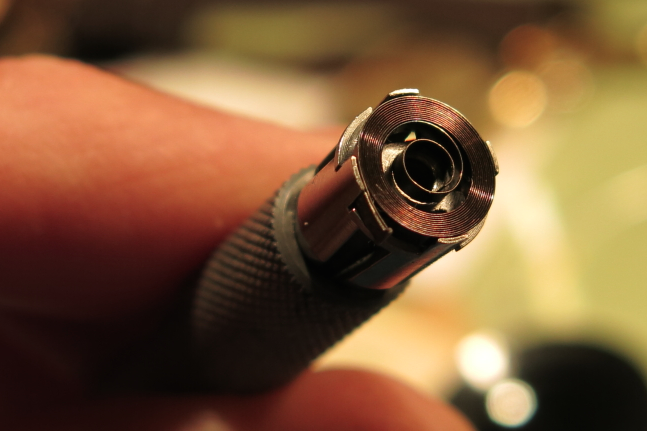 With the balance out of the way, access to the two screws that hold the pallet fork in place is obtained. That comes out next. And everything is ready to go into the cleaner. 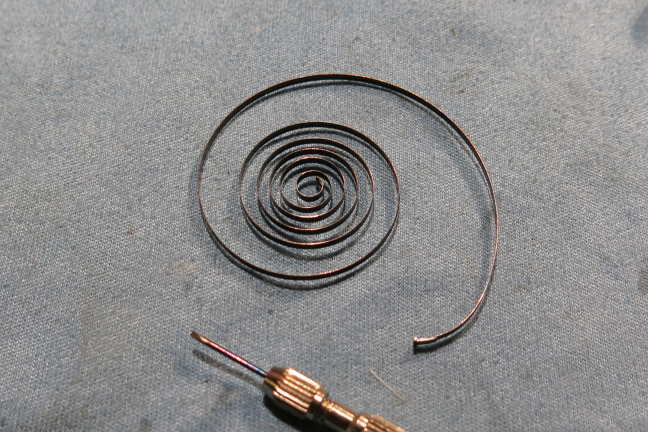 While the parts are being cleaned and rinsed, I will ready a new mainspring to go into the barrel. 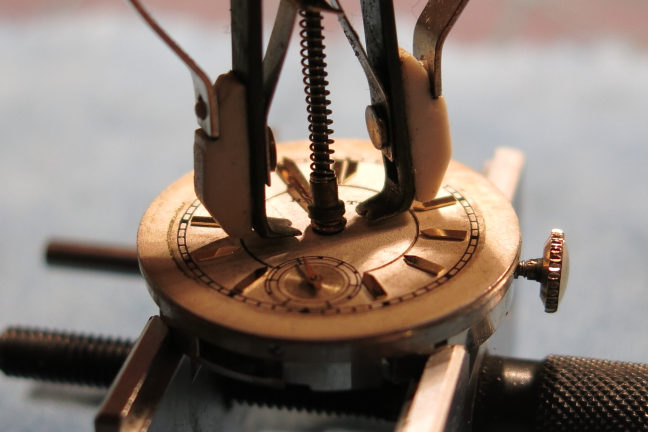 A mainspring winder makes short work of this tricky operation. 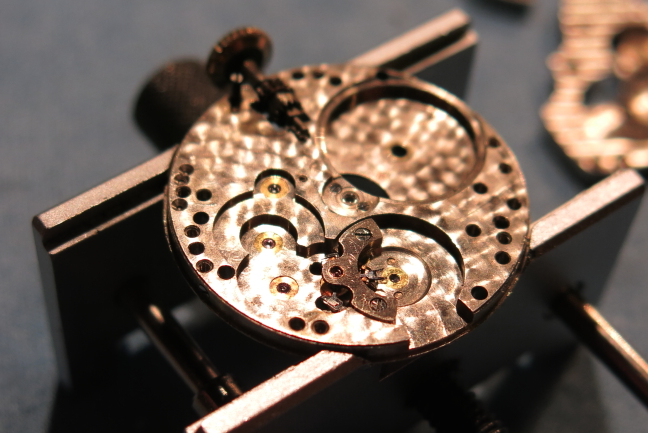 The old mainspring still had some life to it but it's a good idea to put a new one in if you want to have a healthy action and long running watch. 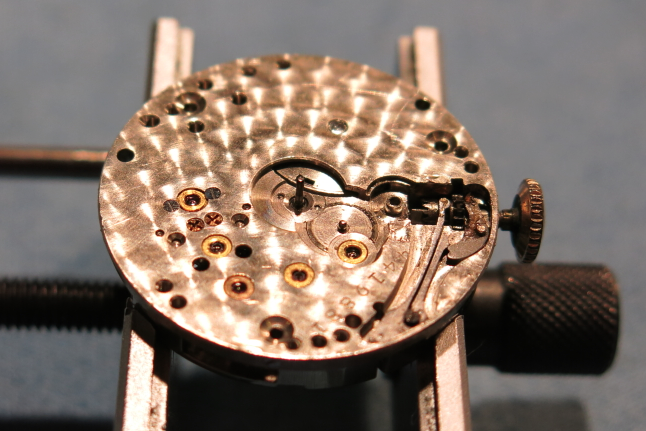 Here the spring is wound into the mainspring winder. A little pusher will slide it into the barrel. And here it is again, in it's new home along with the arbor in the center. All the parts have been cleaned and set out to dry. Now it's time for reassembly. Everything goes back in the way it came out... first in is the pallet fork. Then the escape wheel and the fourth wheel. 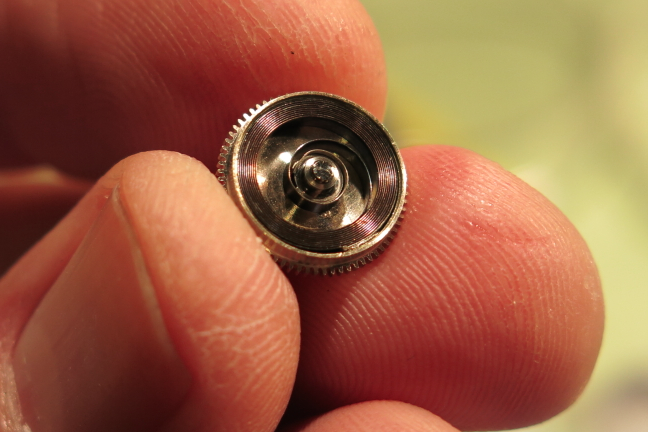 Then the third wheel, center wheel and mainspring barrel. The barrel bridge holds everything in place. And the winding wheel and ratchet wheel go on next. 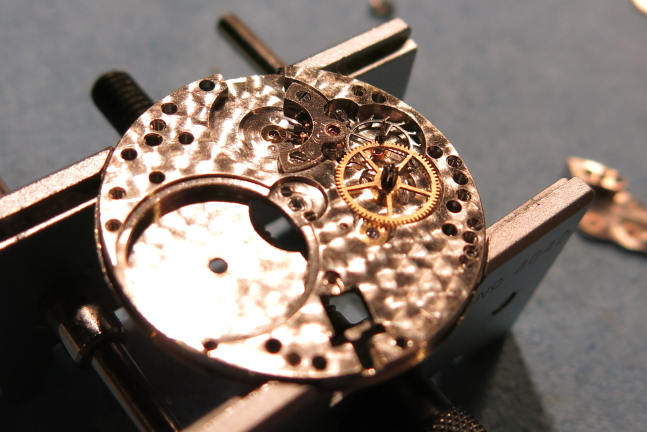 The balance assembly goes on next and the watch can go onto the timer. 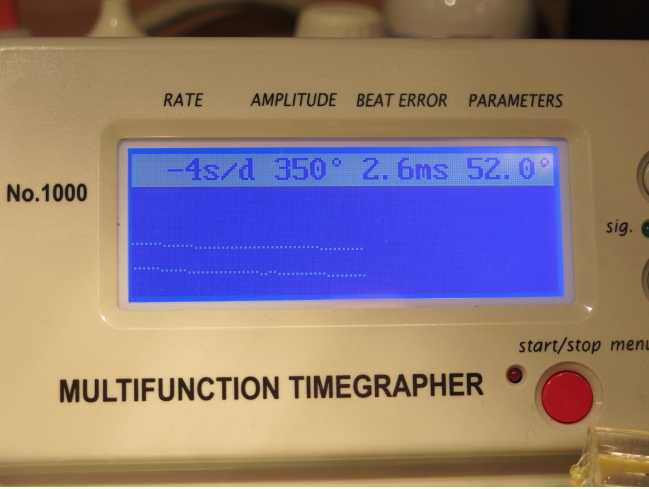 Looks pretty good, 4 seconds slow per day with good amplitude thanks to a a fresh mainspring. 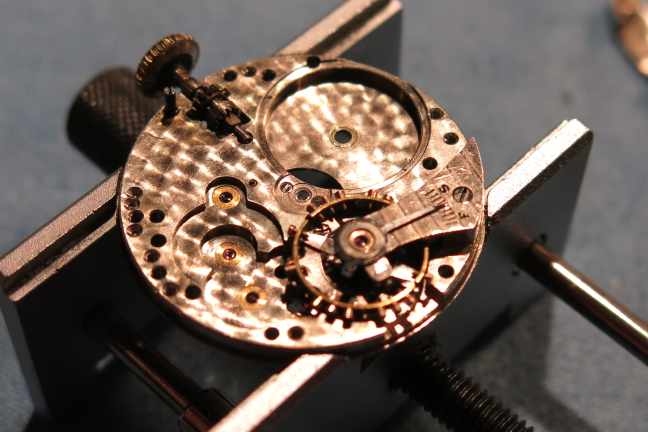 The dial and hands go back on and everything is ready to go back into the case. 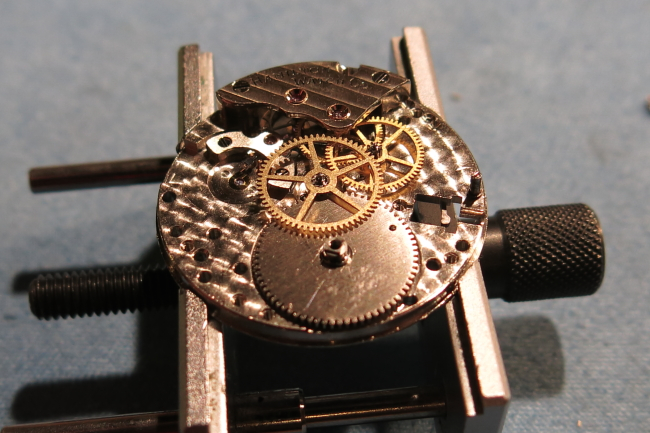 And here's the finished product - ready for some more wrist time. 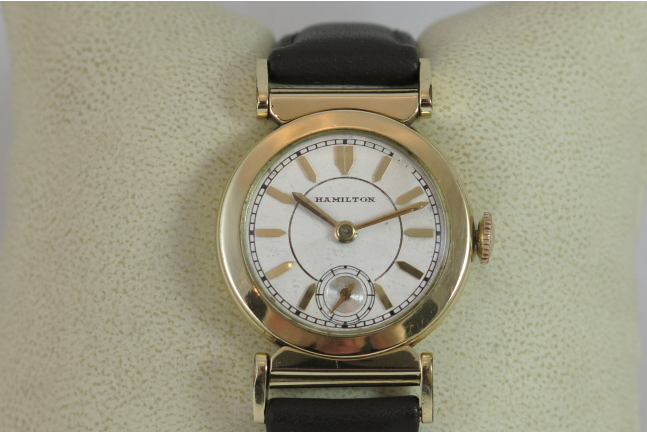 nice to know another Hamilton collector out there! There are plenty of us. Join this forum if you haven't already. 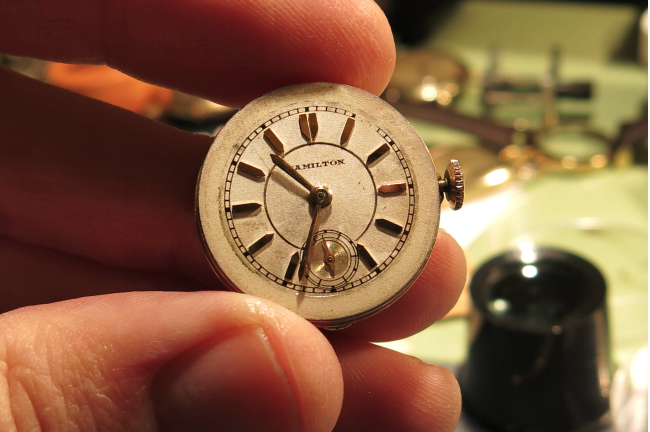 http://www.vintagewatchforums.com You won't find a friendlier group of collectors out there and you definitely won't find a more knowledgeable one.